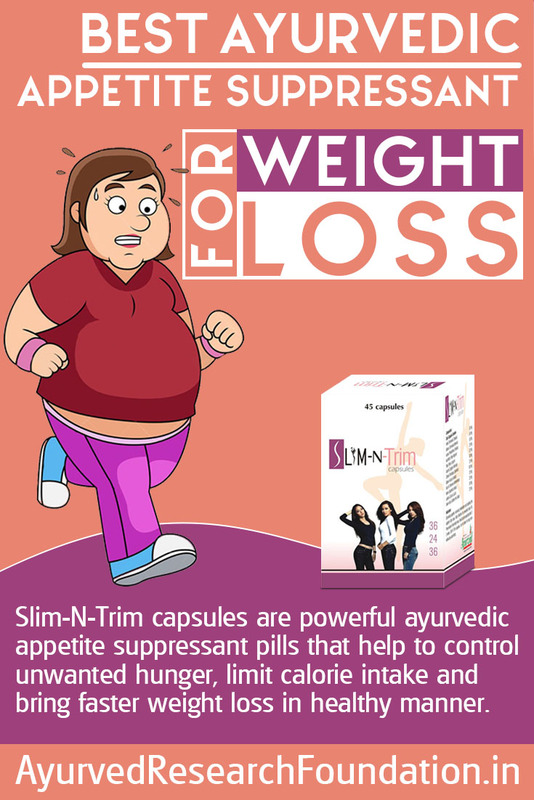 Slim-N-Trim capsules are powerful ayurvedic appetite suppressant pills that help to control unwanted hunger, limit calorie intake and bring faster weight loss in healthy manner. Higher calorie intake is one of the major causes of obesity. People who eat indiscriminately and consume large portions of meal, or eat frequently, put on weight easily. Controlling calorie intake is first requisite to gain healthy weight and fitter body. Slim-N-Trim capsules help people of all ages to regulate eating pattern and consume right number of calories every day. These are ayurvedic appetite suppressant pills which prevent frequent hunger, excessive eating and cravings to eat junk, sugary and spicy foods to reduce calorie intake and weight. These ayurvedic appetite suppressant pills reduce appetite naturally and by promoting healthy digestive system. Ayurvedic appetite suppressant pills flush toxins out of the system, maintain healthy sugar levels, promote quick digestion to supplement energy and nutrition on regular basis to prevent frequent hunger and reduce appetite naturally. The herbs present in these ayurvedic appetite suppressant pills regulate healthy bowel movements and prevent conditions like constipation, slow digestion, excessive gas formation, acidity etc. Clean and healthy digestive system control unwanted hunger and maintain healthy metabolic rate to prevent fat gain. Slim-N-Trim capsules not only control unwanted hunger but also enhance fat metabolism in the body. These ayurvedic appetite suppressant pills digest fat faster and utilize it for producing energy and also enhance flow of blood to reach areas where fat gets deposited quickly. These ayurvedic appetite suppressant pills contain herbs which speed-up process of conversion of fat into lean muscles. This process reduces bags of flesh over body and grows muscle mass to improve energy levels and fitness. Higher muscle mass consumes more calories to stay energized and also keeps a person active to burn down fat. These ayurvedic appetite suppressant pills increase duration of exercises and bring faster weight loss in healthy manner. Slim-N-Trim capsules control unwanted hunger by improving body’s metabolic rate which is beneficial for overall health as well. High metabolic rate not only digest fat and utilizes accumulated fat but also support systems of the body by higher energy supplementation. The herbs present in these ayurvedic appetite suppressant pills improve liver functions to maintain blood purified and supplement antioxidants which inhibit free-radical damage to keep organs healthy and strong. These pills resolve problems like lethargy, stress and fatigue and also promote release of health-promoting hormones to improve metabolism. Slim-N-Trim capsules contain herbs and botanical extracts which make them fit to be used even for prolonged duration. People who lead a busy lifestyle and eat at improper timings can gain immensely and stay fit and lean even in absence of exercises. Slim-N-Trim capsules are 100% safe supplements for men and women of all ages. These are made by using herbs and special care is taken during production to deliver flawless and safe product. These pills even after regular use do not show even mildest side effect. The results obtained by using these pills are natural and last longer in life. Slim-N-Trim capsules possess perfect combination of highly beneficial herbs which are – Bahera, Long, Haritaki, Kali Mirch, Amla, Sonth, Swarngeru, Laksha, Kalijiri, Babool, Neem and Chitrak. These herbs collectively enhance body’s fat metabolizing abilities and promote faster digestion to provide safe result. 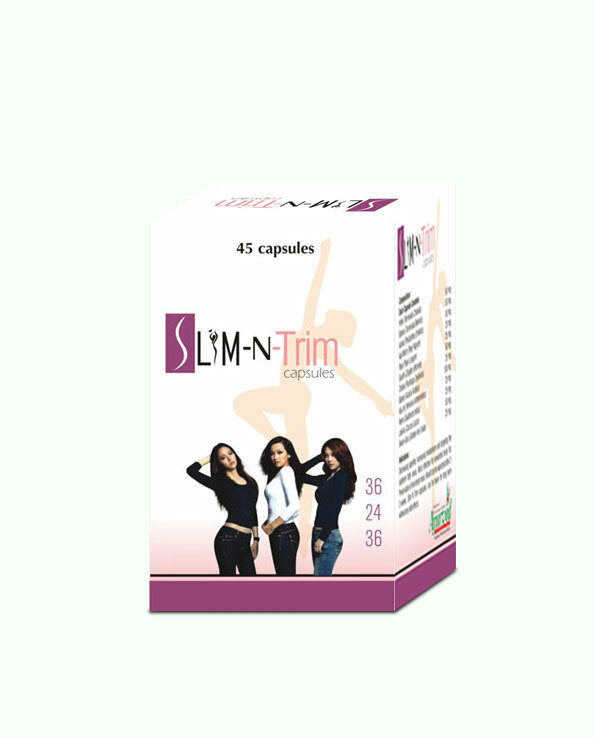 Slim-N-trim capsules have been designed so that one can use them easily and conveniently. You do not have to follow any strict regimen to gain good effects. All you need to do is to consume one or two pills of these with water after meals. Maintain regularity and avoid misses to gain faster results. People with higher toxicity level or suffering with problem of over-eating since a long time may take little longer to gain complete relief. We recommend usage for 6 months for resolving old problem. Otherwise generally 4 months duration is sufficient to provide complete relief. Foods rich in vitamins, minerals and containing healthy fat are recommended during course of treatment for faster results. Maintaining healthy water intake, regular exercises and sufficient rest and sleep is also supportive for faster and better results. There are few easy and simple payment options which you can choose to pay for your order. You can send us cheque, DD along with your order or deposit cash in our account. We accept payments through NEFT and you can pay us on delivery in India. We use FedEx to ship our product and deliver within 3 to 5 working days anywhere in India. We maintain your privacy and deliver products packed in a plain envelope which gives no details about the product. Fantastic product makes you reduce weight very quickly, no negative effects on your stomach so it only affects our daily habit of eating too much, the most amazing is that you do not feel weak and can continue doing things you do every day. I have nothing but good things to say about this product. It boosted my energy level and reduces my appetite. Great product to buy for those who want to do healthy weight loss!! I am very happy with my purchase. There is no strong odor of these pills as some supplements have. And ingredients in these pills are 100% natural. This product is awesome. I have good and effective results. Would recommend to obese people!! By far the best fat loss product I have used. Worked well for me!! Ayurvedic appetite suppressant pills are the best way to reduce weight. It helps in overall improvement of health naturally. It gave me result after regular use of these pills for 3 months. Try it to see the best result. It boosted my energy level and reduced my appetite. Yes, now I am confident, looking healthy and smart. Slim-N-Trim pills are the best for suppressing appetite. It relieves my frequent hunger and helps me to eat less. The biggest benefit of this supplement is that it makes you lose calories even when you are physically inactive. It puts your metabolism in top gear and improves your muscle mass, faster metabolism fulfils energy requirements of muscles by regularly burning down fat, calories and carbs. I am in sitting job and not exercising regularly. Just with dietary control and regular use of these pills I have reduced my weight and extra fat over body. Most importantly I have gained stronger and fitter body simultaneously. Commendable!